I don't know what it's like in your house, but around here we are eating lots of salads because we just had Reese and both put on a little bit of baby weight. I mostly blame myself. And the fact that we live about a mile from Yogurt Time. And that darn cake batter yogurt. But this is not a post about froyo, this is a post about salads. Goat Cheese Caprese Salads, in fact. And have I got a salad for you. 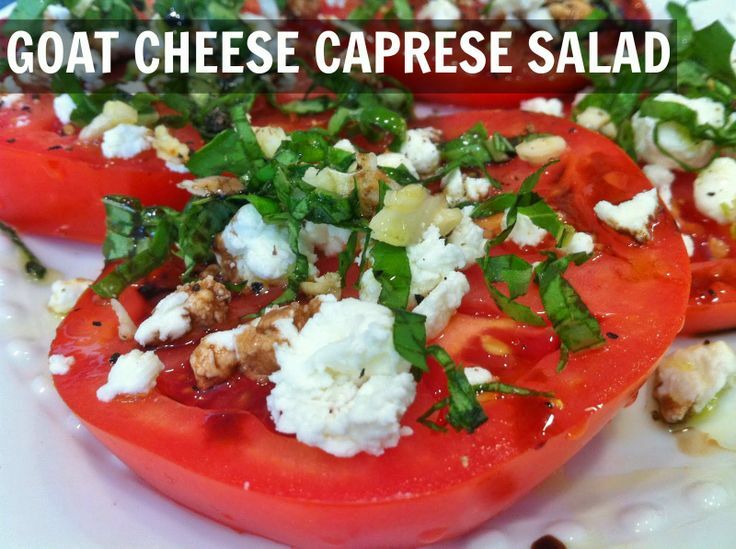 Hubby's second most favorite salad ever is the Caprese salad. His first favorite salad is any salad with our friend Nolan's super-duper-top-secret-most-delicious-ever bleu cheese dressing that he would most likely murder me over if I put it up on this blog. I basically had to make a blood oath with him in order to get the recipe. I later found out he had given the recipe to another couple, so I didn't feel as special. It was fine, I just made myself another batch of that dressing and I felt all better. But this is not a post about bleu cheese dressing, although you totally wish it was. Have I mentioned how obsessed I've been with goat cheese lately? I first became obsessed when I tried my friend Jenna's recipe for baked eggs and ate them basically every day for 2 months. Who am I kidding? I had them yesterday. I started going goat cheese crazy and made a pesto pasta where I basically dumped a bunch of goat cheese in a pasta and called it a sauce. I have even considered giving it to Reese as her first food. Obviously, I won't feed her goat cheese. I'm much too selfish to share my goat cheese a much better parent than that. See, we're already teaching Reese to cheer for the home team. And also that most things are better in pink. But this is not a post about Reese although she is darn cute. This is a post about how I watched a sermon that knocked my socks off. And then we ran out of mozzarella. And having been so convicted the day before, I made my husband the last caprese salad we had. In reality, substituting goat cheese for mozzarella and not being afraid of the balsamic made my caprese that much better. The goat cheese is just so creamy and smooth. The balsamic and basil so sweet. A good friend once told me you couldn't call a recipe your own unless you changed at least three of the ingredients. I only changed two of the ingredients to the classic caprese salad but I julienned the basil. Does that count? No? So, I guess this is not a post about how I invent new recipes. But this is a darn good one. Slice your tomatoes into 4 large steaks each. Sprinkle each tomato steak with goat cheese. Top with basil and garlic. Sprinkle with salt and pepper. Drizzle balsamic then olive oil. Eat and enjoy! I know what I'm making for lunch tomorrow with my fresh garden tomatoes and basil! I'll have to try blue cheese though with it as I don't have any goat cheese or fresh mozarella. Yum! Thanks for the idea. Interesting variation on a caprese! Stopping by from SITS! Popped in from SITS! I've always wanted to try caprese salad. Hey there! Just found your blog...and this is the perfect post to come across. The husband and I LOVE caprese salad, and I've even made it with two different presentations over the last year. Never thought of using goat cheese...what a great idea!